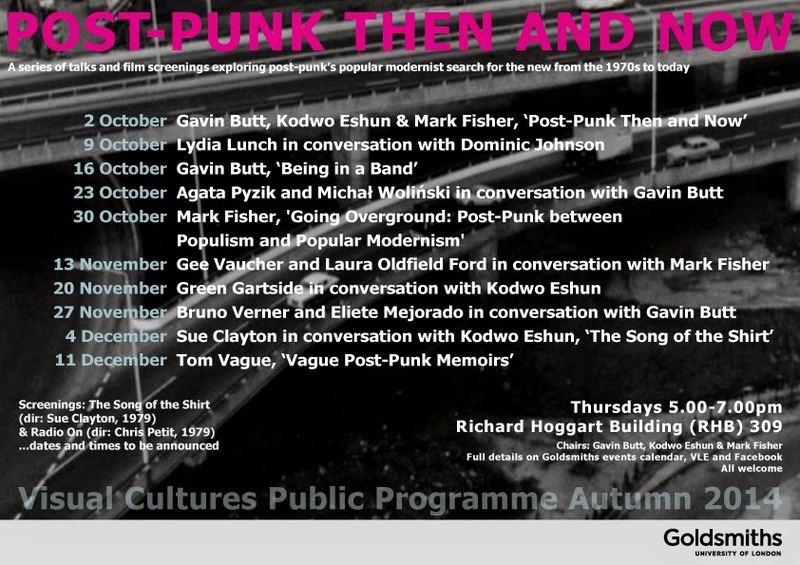 An interesting series of talks and film screenings coming up at Goldsmiths in New Cross on Thursdays starting next week and carrying on through to December on the theme 'Post-Punk then and now'. Some key people from that time will be appearing including Green Gartside (Scritti Politti), Gee Vaucher (Crass), Lydia Lunch and zine innovator Tom Vague. Post-punk was my formative teenage time. I loved Scritti in both their early scratchy punk and their pure pop phases, thanks to them I first heard of Jacques Derrida, even if thanks to them too I mis-pronounced his name for years. I listened obsessively to Lydia Lunch's version of Some Velvet Morning with Rowland S Howard from the Birthday Party. 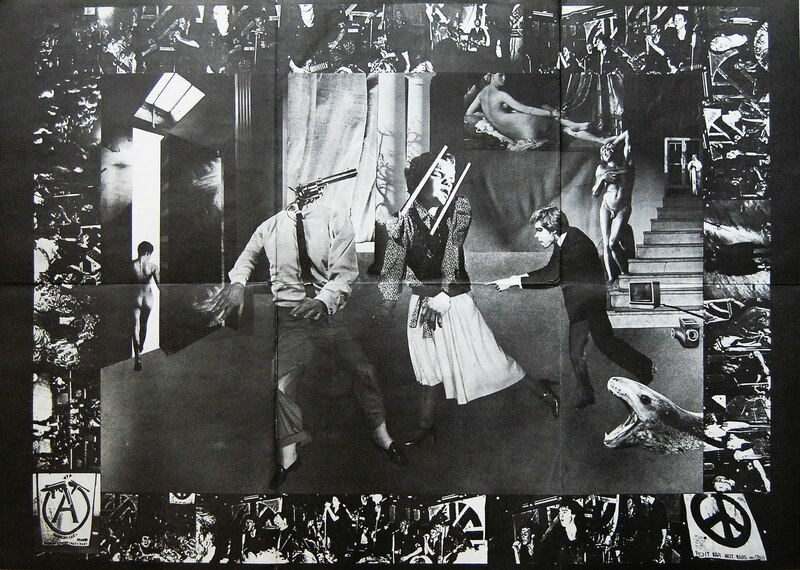 And I had Gee Voucher's Stations of the Crass poster on my bedsit wall as a young anarcho-punk. So I will surely be trying to get to as much of this as I can... and yet part of me is ambivalent about the endless raking over of the embers of the punk/post-punk period, and indeed the later rave period which likewise tends to get fetishised as some kind of sub-cultural high tide mark against which the middle aged judge subsequent generations and usually find them wanting. Maybe everyone likes to think that their youth was the coolest time in history, in that respect the once future-facing punks and the ravers ended up just like the hippies before them, forever harping back to 1977 or 1992 as surely as their long haired forerunners droned on about Pink Floyd at the Ally Pally in 1967. What seems like a period of plenitude, as post-punk does, can also be seen as a period of lack. If we looked to people with guitars and synthesisers for political and cultural inspiration it's because to a large extent we didn't have anywhere else to go for information or ideas. It's interesting to talk about these times, but in a critical way that doesn't reinforce myths. There was no golden age, then, since, or now. I think it's true that each generation of young people live out their lives differently, the internet/social media context today is very different from the 1980s, but then 1980s Sony Walkman/CDs etc. was also different from previous generation. Maybe subculture in the sense of a distinct music-identified scene is less significant now. Maybe the particular fixation of previous generations on music was linked to being starved of the visual. A handful of TV channels and no means beyond super-8 to make/share films for most people. But I guess what I question is the assumption that whatever went before was therefore more significant/radical/avant garde than now.